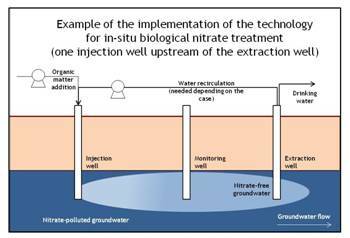 InSiTrate project will demonstrate at pilot scale the feasibility of in situ bioremediation of nitrate-polluted groundwater for the production of drinking water. The pilot plant will be located at Sant Andreu de Llavaneres (Catalonia). Nitrate in situ bioremediation consists on the transformation of nitrate to nitrogen gas through the microbiological process of denitrification. Some microorganisms, already existing in the aquifer, are capable of using nitrate as terminal electron acceptor in their respiratory process in the absence of oxygen. However, this process usually occurs at very low rates in the environment, generally due to the lack of suitable electron donors. Therefore, enhanced bioremediation of nitrate consists on provisioning of suitable electron donors in the form of organic matter. The in situ treatment technology uses boreholes to introduce the organic matter, which may be in the form of methanol, ethanol, glucose or acetate, among others. The key points in this treatment technology are: the well number and location, the type of organic matter supplied, organic matter dosing and process control to avoid undesired process intermediates (nitrite and nitrous oxide). Life+ InSiTrate proposes a new approach for the use of the in situ biological remediation technology, the production of drinking water from nitrate-polluted aquifers. The main innovation in the technology, apart from the goal of the remediation, is the design of the remediation strategy based on modelling and simulation. A design and predictive tool (named IST) based on a mathematical model will be used to mathematically describe the performance (hydrogeochemistry) of the aquifer and the biological remediation reactions. The aim of this tool will be to assist in the design of the remediation strategy to successfully overcome the main problem of in situ bioremediation, well and aquifer bioclogging and to assure a permanent good water quality at the extraction well. The LIFE programme is the EU’s funding instrument for the environment. The general objective of LIFE is to contribute to the implementation, updating and development of EU environmental policy and legislation by co-financing pilot or demonstration projects with European added value. 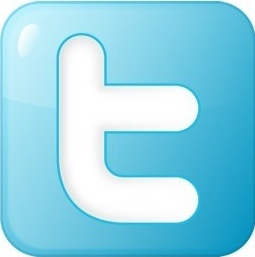 LIFE began in 1992 and to date there have been three complete phases of the programme (LIFE I: 1992-1995, LIFE II: 1996-1999 and LIFE III: 2000-2006). During this period, LIFE has co-financed some 3104 projects across the EU, contributing approximately €2.2 billion to the protection of the environment.